Most of the Nourishment 4 the Soul classes are free. Some classes and workshops do come with a small material fee depending on the class. 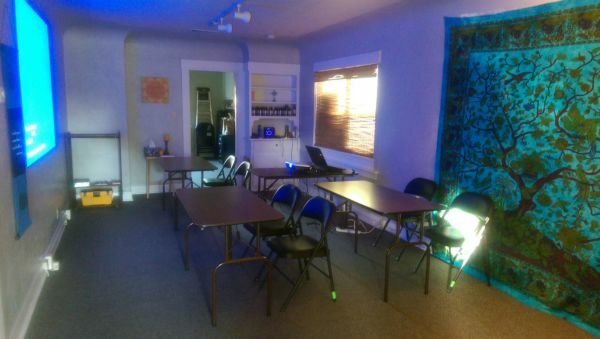 We enjoy teaching to anyone who wants to learn, share, and grow in an incredibly friendly atmosphere. If you are interested in any of the classes on the calendar and cannot afford the materials fee, please let us know. For more expensive classes such as Reiki I, II, and III, we do have a small work share program that allows you to work off the class. Our view at the center is lack of money should never be a deterent to spiritual living and learning! Take a look at all the classes we offer here at Nourishment 4 the Soul and if one or more interests you, please check our Monthly Calendar page for class scheduling. If the class isn't on the calendar, please email us and let us know you are interested and we will schedule the class as soon as we can. Donations are always appreciated. It helps with the cost of running the center. If you would like to donate, please notice our DONATE button below - we are always grateful for whatever people can afford to gift us. Thank you in advance for your generosity! Akashic Records: What are They and Can We Get to Them? People are always talking about the Akashic Records, so we decided to build a class on just that. This class delves into what the Akashic Records are, who can access these records, where these records are how to access the records to why should we access them. If you've ever heard of these records and want to know more about them, then this is the class for you! Information will be on a Power Point Presentation as well as a hand out to take home. Every wondered about Archangel? Are you curious about who they are, what they do and how Archangels can help us? This intro class discusses Archangels from A-Z. Class information takes an in depth view of Archangels, their divine powers, how each Archangels operates and why they are here to assist us in our everyday life. It's great information for the Archangel Seeker! Class information is presented on a Power Point Presentation and you will also get a hand out to follow along and take home. Did you know that there’s an angel for each month of the year? Do you know who your guides are and how these guides can help you every day? This addition to the Archangels series delves into the Angel and Spirit Guide World. We explore the concept of angels, where they come from, what they do, and how Angels guide us. Class information and discussion focuses discovering if you are an empath and how to learn to balance and then block out negative energies around you when needed. For those of us who truly feel the pain and suffering of others, the answer is deeper than just simple grounding. Learn a few ways to help block suffering that is not yours to bear and how to work with empathy in a healthy way! Pam Clifton, who is an empath along with Michelle Patino who is also an empath have joined forces to help those out there who are Empaths and aren’t sure what to do with their gift. Discussion emphasizes how to adjust and protect from outside negative forces that stress the empaths. Pam gives vital information on the signs and symptom of being an Empaths and Michelle, a certified Yoga instructor, will show some Yoga poses to help calm down the energies of the outside world and focus on balance, strength and protection. If you think you are an empath or are an empath and having a hard time, this is the class you don’t want to miss! Did you know that Mother Mary lived 2000 years before the birth of Christ? The Ascended Masters class introduces the ascended like Master Mary as well as may other Ascended Masters. Who are these people and how did they become masters? The class will focus on the rays of ascension and look at 10 ascended masters, discovering their history, powers, energy, and how you can call on them to work with you. Most of us associate ascension with Jesus Christ’s rising from the dead and then ascending to heaven. From a spiritual and energy point of view, what is ascension and how does it affect our mind, body and soul? A quick definition: Ascension involves the acceleration of vibrational energy and a new expansion of awareness which creates a shift in our consciousness. Class material will focus what ascension as spiritual energy within our body, discovering the signs and symptoms of ascension, and how to manage these symptoms once you discover what’s happening to you. You may not even know it’s happening to you. Even if you don’t know it’s happening to you, your body may be reacting to this ascension in many different ways. Ascension changes can occur on many levels of our being. What is it and can you do it? Astral projection (or astral travel) is a term used in to describe a willful out-of-body experience (OBE). This is a form of telepathy that assumes the existence of a soul or consciousness called an "astral body" that is separate from the physical body and capable of travelling outside of that physical body. This class will delve into what is really is, simple procedures, protecting yourself before trying, the dangers in this travel and if you can or want to do it. What is Magic? What is Black Magic? If they both involve magic, what’s the difference between the two? This class takes the magical plunge in finding out what different types of magic there are, how both black and white magic work, how magic is generally used and who get to use the magic. As always, this class takes the objective approach in finding out the history of magic, how society as well as individuals feel about magic and the use of magic today. Information will be presented on a power point presentation along with a hand out to take home with you. This is a step by step class delving into each of the Chakras explaining the energy, color, frequency, and how to balance Chakras. An unbalanced Chakra can affect the way we feel physically and emotionally. To recognize, react and rebalance our Chakras takes practice and this class will help put that into focus. Even if you know and work with Chakras, it's always helpful to have a refresher every now and then. Just like chakras, the meridians are an important part of keeping our energy rich and vital. This class introduces meridians, the meridian pathways, how meridians work, and how to be aware of them to help keep our bodies balanced. This class ties into the intro to chakras by relating how the chakras work with meridian pathways and explains how energy is sent via meridians throughout our bodies. Classinformation is presented on a Power Point Presentation and you will also get a hand out to follow along and take home. This third class of the Chakra series explains the aura's around our body. Auras, just as Chakras and Meridians are an important part of keeping our physical body safe from stress and other harmful factors. Class information will be on what auras are, eye exercises to see auras, observing aura fluctuation, and how to improve our auras. The workshop after class will focus on how to see auras. Class information is presented on a Power Point Presentation and includes a hand-out to follow along and take home. This is a great workshop for the crystal healer seeker! We use a variety of crystals during an energy session with a discussion afterwards on how the crystals felt for the person using the crystals as well as the person receiving the crystal energy. If you’ve never had the opportunity to experience crystal energy or have been using crystals for years, this is a great class to experience. Those who are interested, Energy & Light Workers, Reiki Practitioners as well as Master/Teachers are all welcome to join in. It's the practice of seeking knowledge of the future or the unknown by supernatural means. That’s the dictionary meaning of the word divination. This class will discuss those exact subjects and more. Just like Tarot Cards 101, this class takes a neutral approach to divination examining the positive and negative aspects of divination as well as looking at the types of divination tools that are out there being used right now. Class material will be presented on a Power Point Presentation as well as using such divination tools as dousing rods, pendulums and tarot cards. If you have pendulums, tarot cards or dousing rods, please feel free to bring them. This class features a full hour with a “full hands on” approach to scrying with a crystal ball, try out the tarot cards, see if the pendulum speaks to you, or use the dowsing rods to find water or talk to spirit. This is a fun way to tap into the divine working on your intuitive talents! Crystal Gridding can be considered one of the most effective methods for protection, healing or empowerment of a geographic location. It can be used in any area where you can place crystals or stones, as long as the crystals and stones will not be moved or disturbed. This workshop gives you the materials to create your own grid. You can make a grid for protection, healing or to clear emotions, for example. 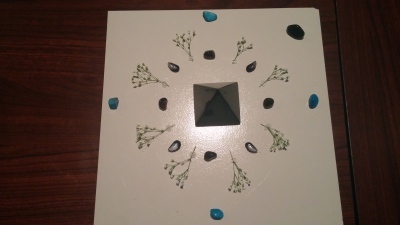 Working with a variety of crystals, gems and stones as well as plants, you will be able to choose the type, learn the healing properties, what type of grid design to use and specific placement on your grid for maximum protection, healing or clearing. You can then glue your grid to take home and use. The class also includes how to activate and clear your grid for a variety of uses. Come and join us for the Do It Yourself Natural Product making! Learn how to make your very own Natural Bath & Body Care products - it's fun, it's easy, and you'll save money!! This class is for men and women. We'll make therapeutic bath salts, body scrubs, deodorant and germ-killing toothpaste. You'll take home some of every item we make and receive a handout with the recipes as well! This is a 1 hour interactive workshop devoted to each item we're making. The cost for this class is $25, which includes the cost of all the materials. Pam Clifton continues her workshop series to host and show you how to make your own natural cleaning supplies. We use harsh chemicals all the time when cleaning and don't give it another thought that it could be harmful to us and our family. Learn the natural and effective way of cleaning anything you need to and not harm the environment. This brand new class focuses on how to use polymer clay, crystals and a stick to create a crystal wand. A crystal wand is a powerful tool to use. Once class information on how to assemble your wand is finished, students will work on how to create a wand. This will also be a type of meditative and intuitive class focusing your energy on the wand as you create it. Pam Clifton takes out her “green thumb” for this brand new workshop dedicated to learning about selective herbs and how some herbs can help with energy as well as many other healthy properties. Pam explains the benefits and assist you in working with these herbs. You’ll get to take a few plants home as well as sample hot herb tea. A handout will be provided with detailed information the herbs selected for the work shop. Please bring gardening gloves…this is a hands on class. Pam Clifton delves into the natural way of taking care of your face! Pam show you how to combined natural products that are not harsh to the skin leaving you feeling clean and fresh! Products will include cleaners, toners and moisturizers for both men and women.